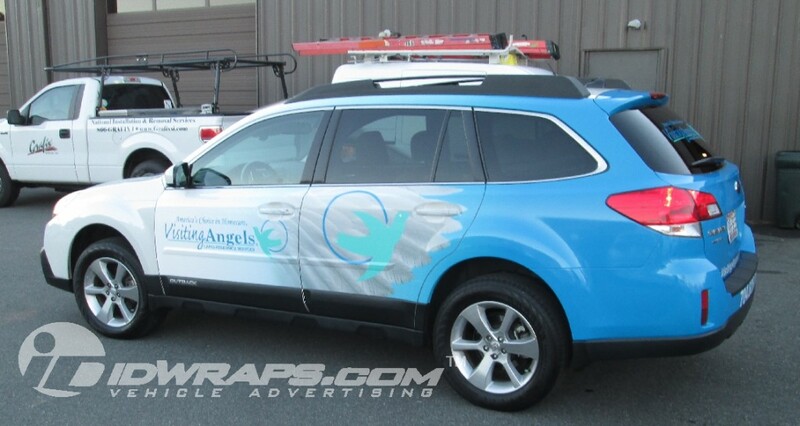 Here is a car graphics wrap we recently completed for another Visiting Angels franchisee. This Subaru Outback received a 3/4 wrap which help save our client some dollars from the expense of a full wrap installation. The upfront savings on the partial wrap is beneficial up front. Another consideration is that a full wrap is often a more economical route to take, when considering ROI, as the resale value is greatly increased. The IDWraps 3M Certified team does these car graphics wrap projects frequently at locations throughout the US. Check them out at: www.visitingangels.com. The swept wing design surely puts their clients at ease with this clean design. For us, it is important to follow the design discipline behind a clean design layout. Too many wrapped vehicles out there are crammed with too many design elements. This makes the advertising much less effective, and sometimes unreadable. We are often in a position where we need to challenge a client’s instincts to include excessive elements or text. We’ve all seen that service vehicle that lists 30 or more services. Many of which, may be easily summarized with less text. Of course contractors do bathroom remodeling. Do we really need to say this on your wrap? The key takeaway here is less is often more. If a prospect has merely 2-3 seconds to absorb your message when driving by, you better keep it short and sweet. Get to the point quickly. The key elements to be driven home are: Who we are, What we offer, and How to reach your business. It is imperative to assign priority to these elements on any car graphics wrap. This offers a sensible flow to the layout and increases legibility. What good is a car graphics wrap if it is not legible? Sounds like a waste of a good opportunity, since most vehicles have exposure to thousands of prospects every day. If you really think about it, less is more is a mantra that can ring true in so many different mediums. How many times have you driven past a sign which contains many lines of information, only to pass buy having no idea what it read. The amount of time that a prospect may be focused on the graphic is a huge consideration. We often do a two to three second flash test in our office when determining the effectiveness of an outdoor advertisement. The essence of the test is to simply print out the graphic on an 8×11 inch sheet of paper and then reveal it to someone for up to 3 seconds, then turn it away. The key here is that the viewer is not familiar with the project or the advertiser. This flash test effectively duplicates the experience of a wrapped vehicle driving by. Unless the vehicle is parked, that’s all you get- is 2-3 seconds to make an effective impression. Cramming all the info possible, and every service you have available will actually have a negative effect. So now that we’ve discussed the less is more aspect, let’s now dive into the flow of the design. The technical term for this is Text Hierarchy. The simplified definition of Text Hierarchy is the act of assigning importance to the information to be conveyed, and modifying it in an organized fashion to create levels of importance. In essence, we want to establish what is to be read by the prospect first. Most idwraps.com clients would like to say it all on their car graphics wrap. As disciplined designers driven by science, it is our job to hone in on our client’s core messaging and establish the top 3 pieces of information. We then ask them to place them in order of importance. We then make the #1 item the most visible, and the later items progressively less prominent. This hierarchy creates a focal point, or starting point for the prospect. A quality design and flow will encourage the prospect to move on to the additional information. The idea here is that in the event someone only gives you a second or two, they may digest the most important information. On the highway, not everyone will read all the information on your vehicle wrap, unless you have the design constrained to just a few words. On our company vehicles, the only text seen is “IDWraps.com” and “Vehicle Advertising.” Yes- that’s it. This is very effective when it comes to retention when folks see us driving by. Our conversion goal on our wraps is to drive traffic to the website. Why have a phone number on the design when nearly all your prospects check you on the web prior to making any phone calls. Who remembers a phone number anyways? A great way to better visualize the whole “less is more” concept; take a look at billboard graphics that you see every day along the highway. Here we have great examples of designs that limit the amount of information being conveyed. The key here, much like vehicle wrap design science, is that prospects also have a very limited amount of time to absorb the information. When a billboard has many lines of information, folks will simply pass your advertisement by without even a thought. When there is no clear focal point, then no one knows where to start reading. A great billboard will have a compelling headline, perhaps an interesting photo or visual, and have excellent flow of information. At IDWraps.com, we often find ourselves studying billboard design and think of how some of the best concepts may translate well to vehicle advertising. One thing is for sure- billboard advertising is expensive. Many billboard campaigns are released on a national level- where there is over a million dollar investment is being leveraged. With this type of gravity in the budget at stake, they better get it right, correct? You better bet. These national campaign billboards are the ones we study the most. We know for sure that a team of nationally known marketing experts have drafted, scrutinized, and executed the design at the absolute highest level. You may be sure that the graphic was also reviewed by a few focus groups. Who is more qualified to measure the effectiveness of marketing than the people whom are likely to purchase your products or services? The focus group is a very powerful tool where marketers will hire random individuals whom represent your target market. Once together, the group is then exposed to various proposed marketing pieces. Then, the group is asked to provide feedback on the presented items. Feedback is usually collected via both verbal and written responses. On written response forms, they are given ratings of 1 to 10 for presented items. An example question may consist of “how likely will this advertisement compel you to make a purchase?” If multiple ad variations are presented, focus group attendees may be asked to rank them in order of effectiveness. The key with a focus group is to truly get to the bottom of what exactly resonates with the targeted market members. So often, business owners, or even professional marketers get hung up in their own personal preferences, or beliefs. This is a very dangerous mindset. If we really think about it; does our personal preferences matter at all when it comes to marketing? Likely not. Unless you are your sole customer, then your personal opinion may matter far less than you may believe. It is our customers and future customers that truly matter. If your not communicating effectively to this crowd, then you could very well be wasting a great deal of advertising dollars. Remember to test your market first, then execute the campaign. This could very well save a great deal of money and deliver far greater ROI on your next marketing endeavor.